Update: Looks like we may have our first glimpse at the Galaxy Camera follow-up. Picked up by Taiwanese site Tinhte.vn, the pictures show a mirrorless camera posed next to three NX lenses. It's an interesting mix of phone and photo snapper, and looks very nice. The touchscreen is clearly the brain of the device, with minimal physical inputs. 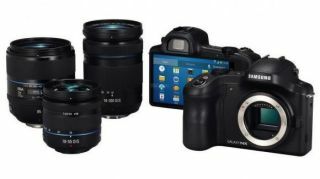 Galaxy NX appears to be the name given to the camera, while according to SlashGear the camera is suggested to have a APS-C 20.3 MP sensor, Android 4.2, ISO up to 25,600 and 1080p video capture. Shin never specified the specs or look of the new Galaxy Camera, so there's no confirming the one pictured above will appear June 20, but the cat may certainly be out of the bag already. Undeterred by a recent JP Morgan report predicting slower Samsung Galaxy S4 sales, the company is going on the offensive with plans for its next Android camera. The Korea Times reported Thursday that Samsung Chief Executive Officer Shin Jong-kyun appears to have channeled his inner Obi-Wan Kenobi this week, deflecting a drop in the company's stock price with a new product tease. Last week, JP Morgan claimed Samsung faced "significant setbacks" with sales of its flagship Galaxy S4 smartphone, causing shares in the company to drop by nearly 6.2 percent - a four-month low. With a mere wave of his Jedi-capable hand, Shin shifted the media's focus off of the bad news and onto one of the new products Samsung plans to launch next week. "Samsung will release our latest mirrorless camera that runs on Google's Android software," Shin told reporters in Seoul yesterday. The company plans to introduce the Galaxy Camera 2 at an event in London next Thursday, June 20, although it hasn't detailed what new features we might expect or when the Android-powered shooter will begin shipping. Although point-and-shoot digital cameras have waned as smartphones have improved, Samsung hopes to leverage its manufacturing prowess by laying claim to a new market for data-equipped smart cameras that rival DSLRs in quality. Shin also confirmed there are no plans to lay down arms in ongoing patent disputes with Apple, perhaps newly emboldened by a U.S. International Trade Commission ruling that older iPhone and iPad models infringe on Samsung patents. Get a refresher course on the original Samsung Galaxy Camera.